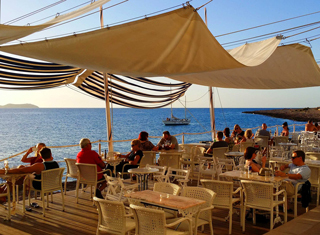 Café del Mar opened its doors for the first time on June 20th in 1980. Locating just a few meters from the Mediterranean facing the spectacular sunsets of the Sa Conillera island. The concept was simple, to put music for the sunsets. 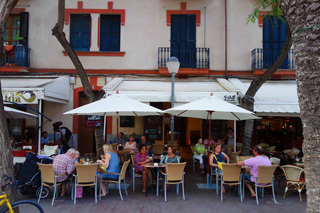 In the early days Café del Mar was a prominent meeting point among the locals and an origin of inspiration for artists and authors. By 1990´s it had become the most popular destinations in Ibiza, while being held as a venue for events hosted by BBC Radio 1, Channel 4 and MTV. 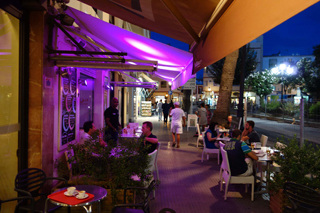 Around the world Café del Mar is possibly the most renown by its annual CDs with chillout compilations. The first official Café del Mar compilation was released in 1994 after an overwhelming demand by the fans. It was a global success and resulted in much respected chillout music series that as of today has been sold in millions. 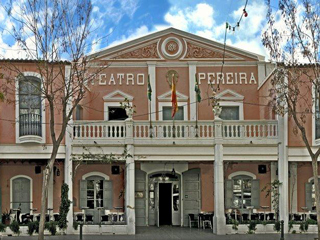 Beautiful Theatre- Cafe in the centre of Ibiza with live music and nice terrace. 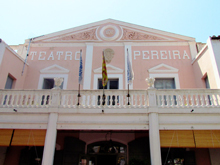 Constructed in 1898 and then the first theatre on Ibiza, declared Well of Cultural in 2001. Dutch composer and producer Eric-Jan Harmsen and his wife actrice Kees ter Bruggen discovered the theatre in 1987. Their oldest son Juangui is now running the place. The pub Can Pou is a coffee bar, located in one of the central streets of Ibiza, overlooking the harbor. 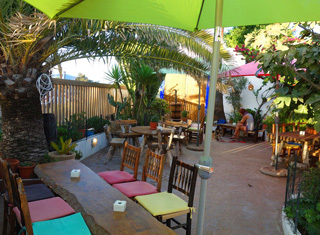 A very nice cafe with bohemian touch with a nice terrace. 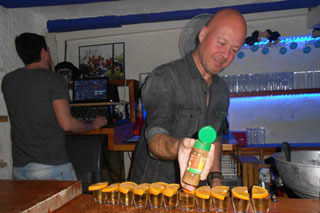 Trendy bar near de harbor with young crowd. In the Summer (May until end of September) the bar is called The Black Sheep. 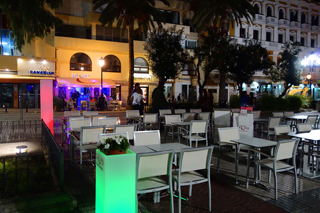 Great bar to see the PR-groups of the Clubbing Parties pass by. 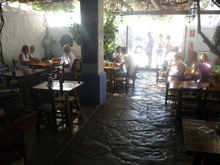 In the Winter (October until the end of April, open only in the weekends) when mainly locals are going, the bar is called La Oveja Negra (which is Spanish for The Black Sheep). Happy people and cheap drinks. Popular bar on the corner of a busy road. 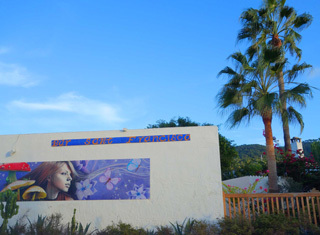 Nice to visit for a coffee when you are going to the hippie market in Las Dalias or when driving North. Locals who live in the mountains have their postbox there. The unassuming façade of this 400-year old house on the San Jose Road hides a magical destination behind its wooden doorway: Km5 Ibiza, where cosmopolitan ambience, superior service, exquisite décor and an abundance of fun and frivolity awaits… Lose yourself within the fantastical garden space, where you can sip signature cocktails in five bars – including the whimsical life-sized Orca (killer whale) bar and famous Fig Tree bar – all connected by winding pathways and beneath the stars. Lounge in the spectacular custom-made Haimas (Bedouin tent), bedecked with chandeliers, Arabian style tapestries and palatial sofas and chaise lounges. 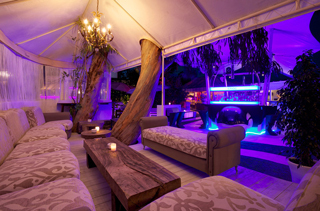 World renowned for its gastronomic restaurant (especially the incredible beef flown in from Argentina), KM5 Ibiza is ideal for intimate dinners and group gatherings alike. Simplicity is the key to this Mediterranean influenced menu’s success, with on-trend twists and flavours satisfying your every gourmet French touches, Italian flavours. 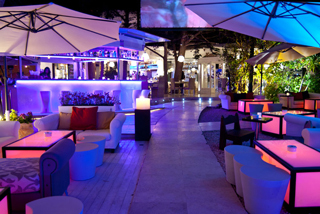 Then there is the flashy Kaviar Lounge – a VIP concept and a true sensual overload of shimmering silver presiding over the garden lounge, where you can indulge in the world’s finest caviar, premium vodka, and treats like chocolate blinis made with Ibiza sea salt, foie gras micuit and more. 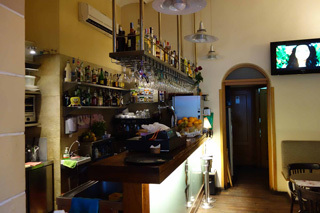 Trendy gay (and gay-friendly) bar of owner Marcus Turco and his husband Julio. 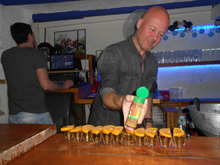 Marcus speaks Dutch and always knows which clubbing parties are going on and where you can get free entrance / guest list. 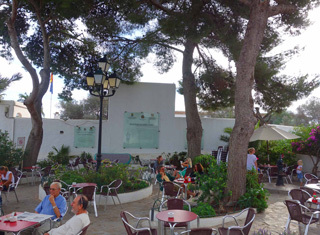 Bar overlooking Vara de Rey, with terrace next to Canadian. 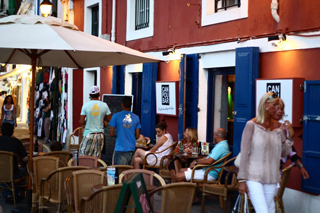 Their slogan: the Tapas bar thats taking Ibiza by storm..: cool, funky and fabulous. 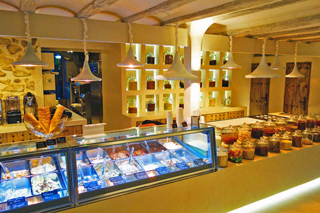 The place to be for coffee and great cakes with a view the visitors of Dalt Vila and the market. 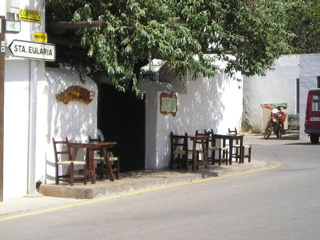 When you are on Ibiza, you really have to visit Santa Gertrudis, in the middle of the island. 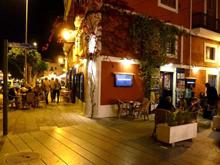 This is a charming village with a whitewashed church and a cluster of shops, galleries, bars, restaurants with nice terraces. Many artist, sculptors and musicians have settled here over the years. 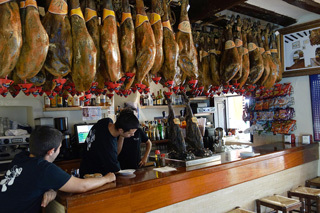 Go to the famous Bar Costa, where they have the best Bocadillo con Jamon (ham sandwich). Even in the winter it is nice to go there. 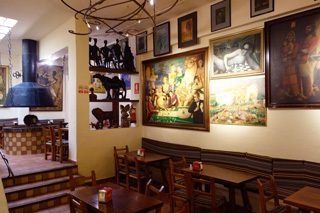 Inside there are 2 fire places and the walls are full with paintings, they say from artist who couldn't pay their bill anymore and swap a painting for food and drinks. 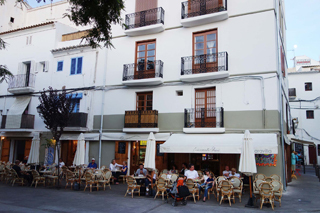 Great self service bar with friendly staff for different sorts of coffee, tea, juices, cakes and healthy salads with outside terrace (next to restaurant / bar Cava) overlooking busy street and Plaza Vara de Rey. 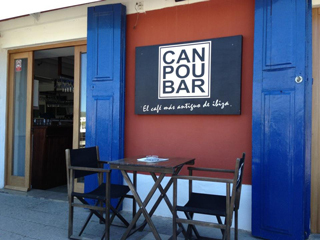 Funny bar you really have to visit on your way back from Las Salinas and Es Cavallet beach to the city. Watch the sunset on Las Salinas, the little church of San Francisco des Estany (the swamps) and the staue of the salt worker. Try their Mexican pancake with goat cheese, walnuts, honey and thyme. 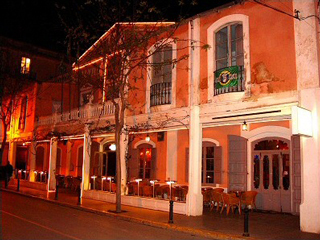 Grand cafe, one of the oldest businesses, in the centre of San Jose with view on the church. 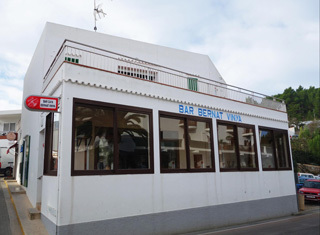 The bar has been in business for around 150 years and was originally set up by two brothers, Joan and Bernat Vinya to sell local products like carobs, almonds and charcoal. They soon realised that opening a bar for the local folks was a better proposition and the business took off. 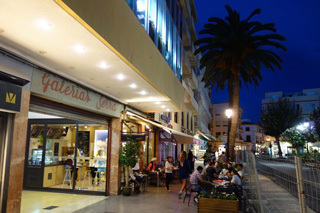 Big terrace, popular by locals. Old men gather to while away the time playing cards and discuss hunting game with the Ibicencan hound, the Podenco, whose pictures cover the walls. Open from very early until very late each day for 365 days a year the bar never seemed to close. In fact, it's only in the last few years that it's closed on Christmas Day afternoon and New Years Day afternoon to give the staff a chance to be with their families. 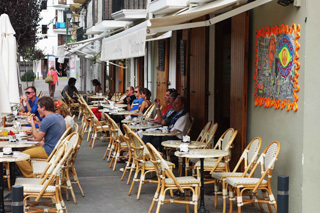 Lovely terrace with view on Plaza del Parque for a coffee, cocktail or great wine. Try their warm waffles with strawberries, ice, whipped cream and hot chocolate sauce. 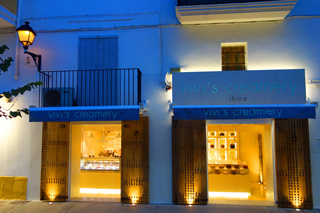 A brand new creamery in the heart of Ibiza offering house made ice cream from local products, fresh detox/ fruit juices and good coffee. You can also create your personalized ice cream on the specially designed cold stone. 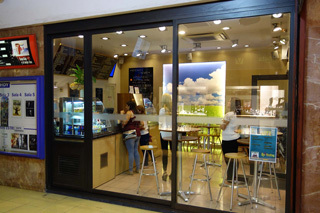 Friendly staff, great interior and beautiful location near Croissant Show and the market place. 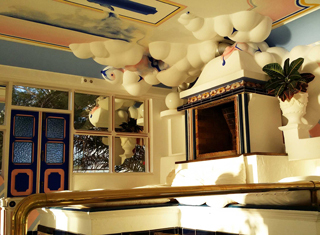 © 2013-2014, Design by Peter Versnel for Ibiza Holiday.